I�m sorry, but I�m glad the Olympics are over. The post-Super Bowl weeks in February are reserved for college basketball, and the Vancouver Games have stolen the spotlight from the greatest sport ever invented. I don�t like hockey, I don�t like speed-skating, I really don�t like curling (unless it�s the shockingly attractive Russian women�s team), I don�t care about Lindsay Vonn and I don�t like Canada. There is nothing good about the winter Olympics. So let us celebrate the conclusion of the 2010 Winter Olympics as we curse Sidney Crosby for ruining American nationalism. It�s time to come clean. I was dead wrong about Virginia. Last month, I wrote five whole paragraphs about Virginia�s 3-0 ACC record, congratulating myself for such a genius pre-season sleeper choice. If I had waited a few weeks before throwing a celebration for myself, I would have saved myself quite the embarrassment. The Cavaliers have lost seven straight games-- the latest a 67-49 home loss to Duke yesterday�and sit at 5-9 in the league. Star sophomore Sylven Landesberg didn�t play against the Blue Devils, which is the latest blow for a team that suddenly can�t defend and has almost no reliable scoring options outside of Landesberg and forward Mike Scott. Virginia has already won more games in the ACC than last season, so it�s not as if Tony Bennett�s first season has been a disaster. Still, after acting like God�s gift to college basketball prognosticating in an earlier column about the Cavaliers, I feel I should own up to my mistake. So there�I was wrong about Virginia. Happy now? Kansas State fell in overtime to Kansas in the first meeting of this series at Bramlage Coliseum but now must head east to Lawrence, where the Jayhawks haven�t lost since 2007. Oklahoma State whipped the Jayhawks on Saturday, so at some point this week you�ll probably hear that Bill Self�s players will be �angry� and �out for blood.� I don�t always buy into that. 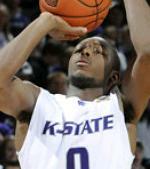 Kansas State�s a fiery opponent that won�t back down at Allen Fieldhouse. However, Kansas State can look very ugly offensively at times and shot 19 percent in the first half against Missouri this weekend. If that happens again, the Jayhawks will run away with this one. Da�Sean Butler hadn�t been held to single-digit point totals during Big East play�until the last two contests. He made just five of 22 shots from the floor against Connecticut and Georgetown. Florida has done enough to avoid missing a third straight NCAA Tournament, but the Gators aren�t totally safe just yet. A win on Tuesday might cement a bid, while a loss would leave UF needing a win in Lexington on Saturday to feel comfortable. Clemson hasn�t traditionally played well on the road under coach Oliver Purnell, but the Tigers earned a huge victory yesterday at Florida State. Buzz Williams� team has now won three straight overtime games after needing an extra period to knock off Seton Hall yesterday. Rick Pitino won�t care if the game is close tomorrow. With Syracuse looming this weekend, his team just needs a win. Upstart Saint Louis has turned Chaifetz Arena into a pit. The Billikens have won 15 of 17 games there this season and their one loss, to Xavier last week, came by two points. It�s Greivis Vazquez�s senior day. For old time�s sake, will he proclaim that the Comcast Center is �his house,� which is how he referred to Cameron Indoor Stadium last year? This time, he�d actually be correct.